Jaime Reyes was an ordinary kid, until a piece of advanced alien tech shaped like a scarab attached itself to his spine, giving him superpowers, and the Justice League dragged him into space to fight an evil satellite. Now he’s back in El Paso, trying to put his life back together after being missing for a year – and trying to learn how to control the scarab in his back, which wants to turn him into a killing machine. Oh, and the scarab’s creators, the Reach, have arrived on Earth, and Jaime’s the only one who knows they’re here to take over. 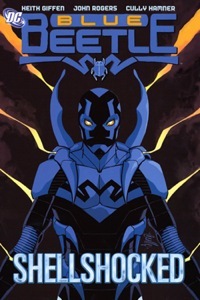 Can the new Blue Beetle stop an alien invasion, protect his family and his city, and survive a legacy that’s already killed both his predecessors?